Periorbital dark circles are a result of pooled oxygenated blood showing through the skin beneath the eyes. Because this skin is thinner here than anywhere else in the body, blood vessels are seen more easily, giving the area a bluish appearance. These dark circles are often associated with lack of sleep. However, they are more commonly related to genetics and ageing. As we age, we lose a subcutaneous fat which usually masks the blue colour below the surface of the skin. This is why elderly people often have prominent dark circles under their eyes. 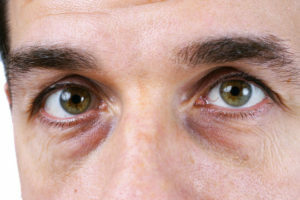 Certain people are also more genetically predisposed to having thinner skin regardless of age, meaning that the blood under their eyes shows through better. People with darker complexions, in particular, may deal with hyperpigmentation as the skin around their eyes becomes darker due to an abundance of melanin, the pigmentation that gives skin its colour. To help avoid circles under the eyes, it is important to protect your skin from the sun. High factor sunscreen can help to stop the premature thinning of the skin which leads to periorbital dark circles. The Milo clinic is regarded as the leading centre in the field of treating dark circles and tear troughs under the eyes, with Tatler magazine recognizing Dr Nick Milojevic every year in their prestigious Tatler Beauty guide, as the foremost authority in treating this problem.